Courtesy of Brian Orland Farmers belonging to the Apa Tani tribe transplanting paddy in the Lower Subansiri district of Arunachal Pradesh. ZIRO VALLEY, Arunachal Pradesh — The end of April is planting time for the women of the Apa Tani tribe. Their 50-square-kilometer valley is a meticulously groomed jewel of green conservation, compared to the flood-beset Assam plains below or the slash-and-burn plots that neighboring tribes cultivate in the shrinking forests of the surrounding hills. 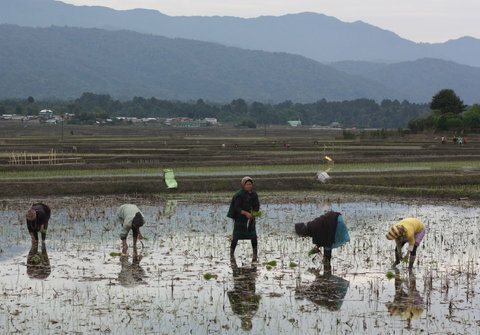 Field dispatches from a climate change researcher in Northeast India. 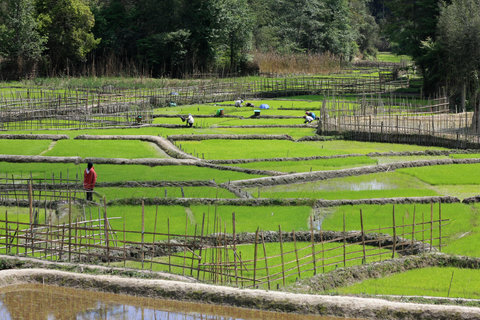 Here in Ziro Valley, teams of rice planters have already finished the annual refurbishment of the intricate network of interlinked irrigation channels. 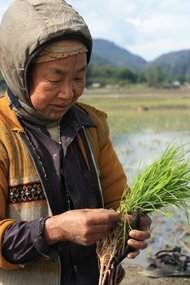 Now women laboriously transplant rice seedlings by hand, one at a time, in the paddy fields. Sun-wrinkled grandmas, adorned with traditional face tattoos and nose plugs, bend to the task. Crouching right alongside them, their giggly granddaughters sport knock-off designer sweaters. Courtesy of Brian Orland A farmer untying a bundle of saplings in Lower Subansiri district. The divergent costumes of the women signal lifestyle shifts that now confront the Apa Tani just as climate change heightens the challenges facing their Himalayan paddy paradise. Can they salvage the system of cooperative leadership and reciprocal labor-sharing that has delivered them such bountiful paddy harvests for the past 500 years? Or should they seize the opportunities of higher education, political party patronage and diversification into cash crops? Each of these development paths has its proponents among the 28,000-member tribe. But both sides agree on the need for strict environmental conservation in such a compact, densely populated and intensely cultivated tribal homeland, so traditionalists and innovators alike have joined forces to foster customary Apa Tani communitarian values. It’s an uphill struggle, according to Tage Kanno, a 45-year-old pediatrician of Tajang village. As young people go off to college, farmers forsake rice for more remunerative crops and families move out of the tightly packed villages for spacious surroundings. Traditional Apa Tani dwellings clustered together in cramped household units as a safeguard against factionalism. Common concerns were aired openly in the lapang, a covered platform in the village square. Ultimate authority rested with the bulyang, a council of elders. These days, though, the lapang does not see much serious discussion, and the bulyang has been reduced to ceremonial functions. Instead of the steady hand of a collectivist leadership, political parties now vie for slots in the panchayat, or local village council, and a single seat in the state legislature. To guard against such dangers, Mr. Kanno — although educated and worldly (he’s been as far as Washington, D.C., and Machu Picchu in Peru) — chooses to live in a modest house in his ancestral village. His fellow tribesman, Hibu Tatu, 45, has made the opposite choice. He lives in a large house, by Apa Tani standards, on a consolidated hectare of land some four kilometers away from the cramped village of Hong. There, he earns handsome profits from crops like broccoli, okra, apples and, most recently, a 30-meter greenhouse full of roses. To plant, weed and harvest his cash crops, he employs seasonal migrant workers from the tea tribes of Assam. His wife is now a member of the gram panchayat, or local government, having run uncontested for the female quota seat. Mr. Tatu’s shift to cash crops was simply making a virtue of a necessity. He consolidated his holdings in the outskirts of Hong when neighbors there started abandoning fields in favor of paddy closer to the main village. But, as the outlying farmers dwindled, the local irrigation networks fell into disuse, forcing a switch to rain-fed farming, which better suited vegetables and flowers. But with climatologists predicting accelerated hydrological stress due to climate change, Arunachal will face growing challenges in precisely the area that has been the tribe’s forte: water management. So core Apa Tani ecological values will matter more than ever: never leave fertile land fallow, fertilize only with waste, harvest trees only for firewood and house construction and then plant a new one for each tree harvested. How will these values be passed on, even as the bulyang’s influence wanes? To this end, Mr. Tatu and Mr. Kanno have joined forces under an organization called Ngunu Ziro, or “Our Ziro.” It supports women’s self-help groups for income generation and organizes eco-camps to teach Apa Tani children about their natural environment. Its current campaign, dubbed “Zero Waste,” encourages ecologically friendly waste management practices like segregating trash into its recyclable components. Courtesy of Brian Orland Beds of paddy seedlings in Lower Subansiri district. Such efforts seem to help bridge the generation gap, at least for now, as attested by the mixed groups of women transplanting paddy. Ankle-deep in mud and water, they looked up from their work one recent April afternoon to observe a political rally pass by on the nearby road — dozens of motorcycles and 10 white S.U.V.’s, horns blaring and party flags streaming. The women gave it barely five seconds of consideration before they returned to their tedious, vital task of planting the paddy. Brian Orland, a Fulbright-Nehru Fellow, is studying climate change adaptation along the Brahmaputra River, where the environment challenges the region faces are likely to be repeated in other parts of developing Asia. His dispatches will appear regularly in India Ink. Last month, he wrote about the search for new crops and farming methods in Assam.